The RSPCA released a video yesterday showing Alfie when he arrived at a shelter in March, weighing 176 pounds. Since then he has lost 66 pounds. Alfie the loveable Labrador was signed over to the RSPCA after his elderly owner kept forgetting he had already fed his pet. 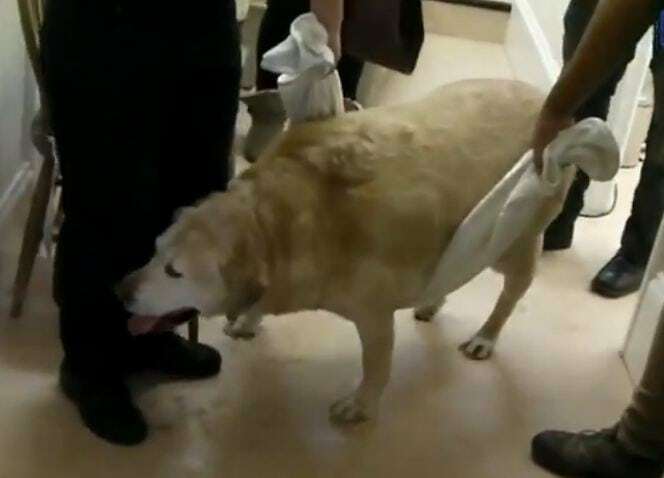 The 12-year-old pooch tipped the scales at an eye-watering 80 kilos / 176 pounds when he arrived at the RSPCA’s Leybourne Animal Centre on March 5, 2012 and he was so fat it took four people using towels as slings to lift him. Christine Dooley, centre manager, said: “He literally could not stand up when he arrived because he was so fat. I have never seen a dog that fat before in my 27 years with the RSPCA, he must be Britain’s fattest pet. “He was just a massive blob with a leg at each corner. The lardy Labrador struggled to walk more than few steps and could not even lift his legs a couple of inches into a raised bed in his kennel so staff at the centre made him comfortable with a piece of carpet and blankets on the floor. The heavyweight hound’s neck is so big Alfie wears the same size collar as a St Bernard dog. He has been put on a carefully calorie controlled diet with two meals a day, weekly weigh-ins and strictly no treats. His extreme obesity caused him to pant as he struggled to breathe, may have damaged his joints and led to pressure sores on his legs. But since arriving at the centre in March this year (2012) he has already lost 30 kilos (about four and a half stone) – more than half way to his target weight. Christine added: “When he first came in he couldn’t go on walks because of his size but each day as the weight is coming off he is able to take a few steps further. We have to be careful when staff take him for a walk because if he sits down and refuses to get back up we have to call in extra people to lift him up again. Once Alfie has reached a manageable weight staff at the centre near Maidstone, Kent, will start looking for a home for him where his owner will need to keep up his healthy diet and gentle exercise regime. As of September, 2012, Alfie weighs 50 kilos / 110 pounds. He still needs to lose another 20 kilos / 44 pounds. Sadly although Alfie’s obesity is extreme it appears to be a growing problem among dogs. Since 2009 the number of complaints and calls the RSPCA has received about fat, obese and overweight dogs has steadily increased from about 20 a month to more than 30. RSPCA Inspector Caroline Doe who is based in Kent said over indulging a pet is just as harmful as not feeding them enough. She added: “Alfie’s case is exceptional, I’ve never seen a dog that big before, but there are lots of dogs out there which are overweight or obese. To check if your dog is a healthy weight you should be able to see and feel the outline of their ribs without excess fat covering them, they should have a waist which is clearly visible from above and their tummy should be tucked-up from the side. 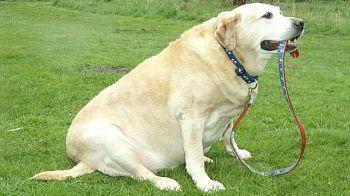 If you think your dog is overweight contact your vet for a health check and if necessary, feeding and exercise advice. Dementia is a very cruel and debilitating illness. I’m sure his human didn’t have the capacity to remedy the situation on his own. The dogs owner was said to have Alzheimer’s and would feed him numerous times a day, forgetting that he had already been fed. I believe his owner was very old. I wish the best for Alfie but please do not judge the owner. Dementia, Alzhimers both are cruel dieseses. My grandfather had Alzhimers and would just finish lunch, have the plate in front of him & ask when lunch was. dog I’ve seen, begging for a treat etc. not many friends left. Alfie may be his only friend and companion. So although not right for Alfie, it is my guess if the owner was in full capacity it would not have happened. Prayers for both Alfie & Tge owner. hard or noticed him gaining so much weight either. What does Alfie look like now?